The Client will start a Phase I decongestive Vodder-type complex lymphatic drainage program of 4-5 sessions per week for 4 weeks. Compression therapy that consists of multilayered, inelastic bandaging of the limb, including each toe and finger, is performed immediately following the decongestive lymphatic drainage. Multi-layered Compression bandaging is performed distal to proximal. Between bandage layers are interspersed with foam rubber pads to evenly distribute the force of the bandage and to apply increased pressure to the particularly fibrotic areas. Bandages are to be worn 24/7 until the treatment is complete and proper compression garments are prescribed. Therapeutic Decongestive Exercises with compression bandages are performed to evacuate from the peripheral to centralized drainage channels. The bandaged patient is assisted through exercises that included AROM with the muscle and joints functioning within the closed space of the bandaging. 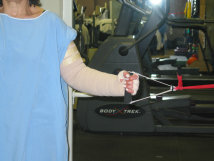 The Client is to schedule for a baseline L-DEX, used to assess unilateral lymphedema of the arm. This tool measures the amount of fluid surrounding the cells which make up the muscle and tissues of the arm. The Client will be scheduled for a baseline CROM and MT. The Computerized Muscle Testing and Range of Motion establishes the baseline data for accessing expected rehabilitation potential, setting realistic goals, and measuring progress. The CMT/ROM will be completed initially to set a baseline of information, and approximately midway and at the end/discharge, to follow the function and progress with changes throughout the period of the patients treatment. Example: This illustration below shows acute Bilateral Lymphedema affecting the legs. 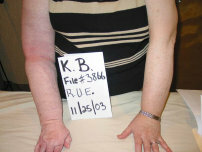 (left picture) and the results of effective complex lymphedema therapy treatment (right picture). Example: This illustration below shows a compression garment for the right arm (left picture), bilateral stockings of the legs (center picture), and compression bandaging of the left arm and hand (right picture).